Designed by Thomas Sopwith himself, of the Sopwith Aviation Company as a further development of the Sopwith Pup, the iconic British Sopwith Camel biplane was the most successful Allied scout fighter of World War One and became the steed of many Allied air aces. Introduced to the Western Front in 1917, the Sopwith Camel along with the Royal Aircraft Factory SE.5, a very good higher altitude scout, helped regain control of the skies and Allied pilots shot down 1,294 enemy aircraft flying the Camel (an average of 76 victories per month, for the 17 months the Camel was in service). In many ways, it was held in the same regard to Great Britain in World War One, as the Supermarine Spitfire was in World War Two. 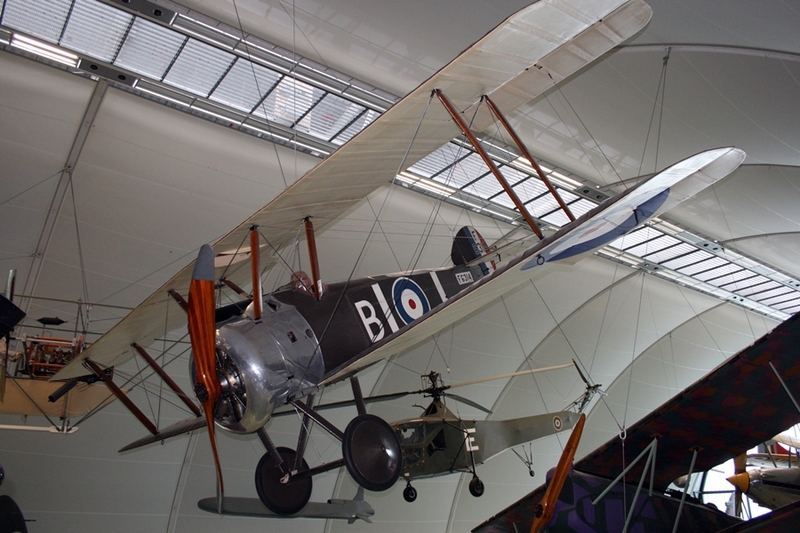 The first Sopwith Camel fighters to enter service were with the Royal Naval Air Service (RNAS). No. 4 Squadron RNAS received their first aircraft in June 1917 and the Royal Flying Corps (RFC) soon followed with aircraft arriving at No. 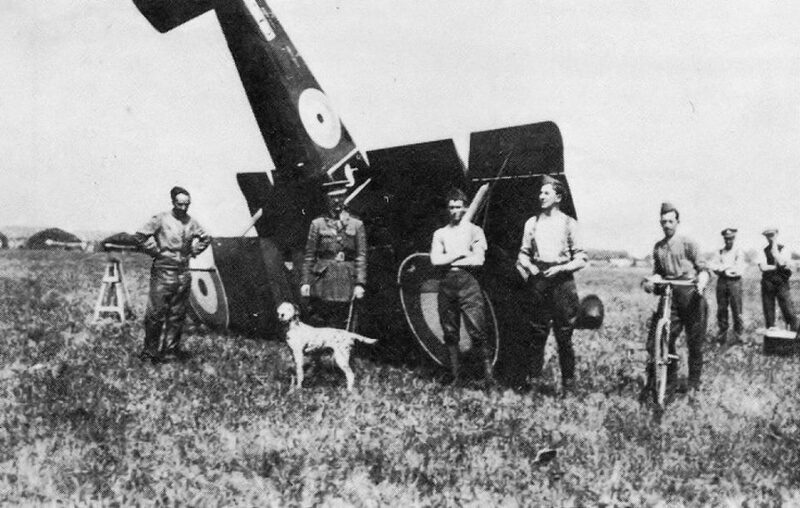 70 Squadron in June and July 1917. Given large orders were placed by the Admiralty and War Office, the Sopwith Aviation Company had to sub-contract production to numerous firms including Boulton & Paul Ltd., Clayton & Shuttleworth, Hooper & Clayton Ltd and Ruston, Proctor and Company. The Sopwith Camel was most commonly powered by a 130 hp Clerget 9B 9 cylinder rotary engine (other engines were used though such as the Bentley BR1), had a top speed of 182 km/h (113 mph) and a service ceiling of 5,791 metres (19,000 feet) but was said to be unresponsive in combat above 3,657 metres (12,000 feet). Armament consisted of 2 x nose mounted 0.303 Vickers machine guns (7.7mm) synchronized to fire through the propeller. To reduce drag the guns were partially covered by a fairing over the breeches, resulting in the “hump” behind the engine that lead to the Camel name. The Camel was highly maneuverable and a very capable dog fighter in the right and experienced hands, but was very tricky to fly. British historian Peter Hart stated the Camel “made a virtue out of its main defect” (Hart and Steel, Tumult in the Clouds, pg.221). With that snub nose, its centre of gravity was very far forward – take a look and you will soon notice that the pilot, guns, fuel tank and engine were all within the forward third of the airframe (the majority of the aircraft weight)! Carrying all that weight in the nose, contributed to by high torque rotary engine and then a short wingspan, the Camel flight controls were highly sensitive. As such, with more than a light touch on the controls. it was susceptible to spinning, especially if the engine stalled and many a novice pilot was killed or severely injured learning to fly it. 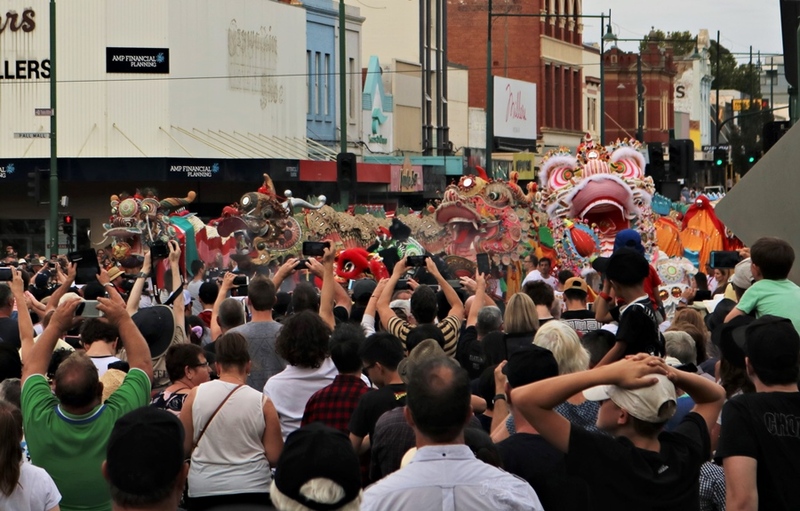 I have read many times that flying the Camel provided a choice of a “wooden cross, red cross or a Victoria Cross“! 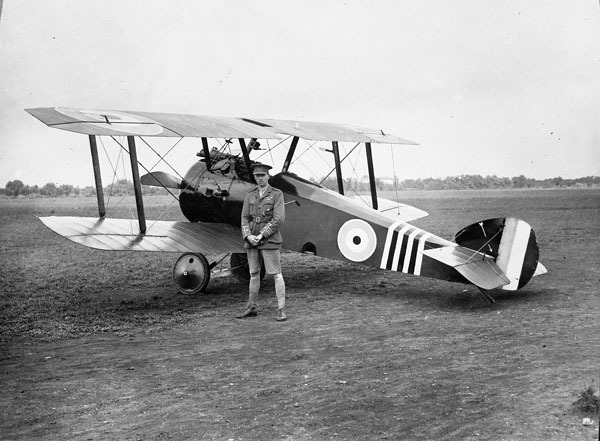 The most successful aircraft in the history of the RFC/RAF was a Sopwith Camel F.1 (B6313) flown by a Canadian air ace, Major William G. “Billy” Barker. Over a year from October 1917, he flew 412 operational flying hours in this aircraft, shooting down 40 enemy aircraft and 6 balloons on the Italian and Western Fronts. Unfortunately it was dismantled following this in 1918 and lost to history. “Billy” Barker finished the war with 50 air to air victories and during the course of the war, was awarded a Victoria Cross (the highest award in the British Commonwealth), Distinguished Service Order (DSO) and bar, and the Military Cross with 2 Bars. His brave actions made him the most decorated Canadian serviceman. Ironically with the rapid progress of aircraft design in those early years of aviation, by mid 1918 the Sopwith Camel was already outclassed as a day fighter by newer, faster and quicker climbing German aircraft such as the Fokker D.VII, so it mostly saw out the rest of the war in ground attack and army support roles (especially after the great German offensive of March 1918). Its replacement, the Sopwith Snipe had numerous development issues and this saw the Camel fly on longer than planned and they even ended up being used in the unsuccessful 1919 to 1920 Allied/Commonwealth forces intervention into the Russian Civil War against the Bolsheviks (we all know how that ultimately ended up!). Numerous nations operated the Sopwith Camel during World War One and it flew with the Royal Flying Corps / Royal Air Force, Royal Naval Air Service, Australian Flying Corps, Belgian Military Aviation (supplied in 1918), the Greek Naval Air Service, the Imperial Russian Air Service, the United States Expeditionary Force (Western Front), United States Army Air Service (two squadrons were attached to the RAF in 1918), United States Navy (Lieutenant Junior Grade David S. Ingalls became the US Navy’s only air ace of World War one, flying Camels he achieved 6 aerial victories). 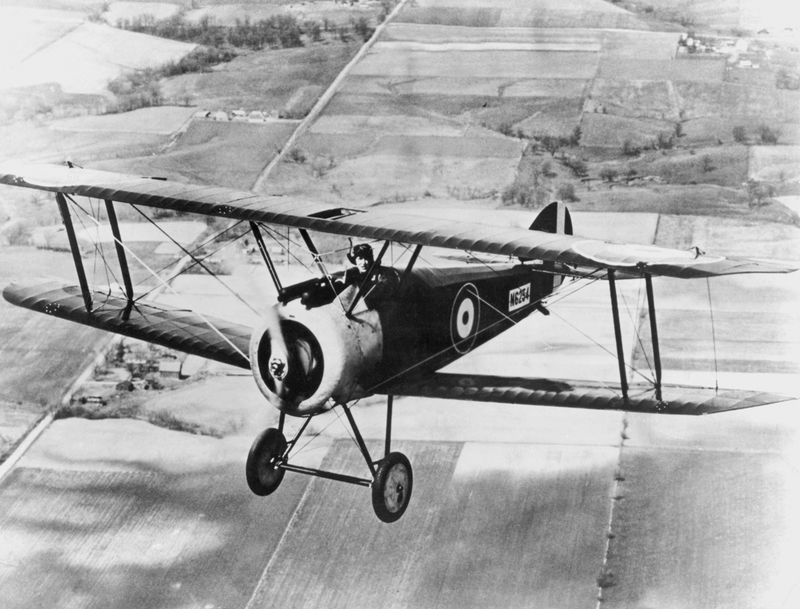 The Royal Air Force retired their Sopwith Camel fighters in 1920 but other nations continued to operate the type as a fighter and training aircraft into the early 1920’s with the last retired in 1928! Post war Sopwith Camel fighters flew with the air forces of the Soviet Union (ex Imperial Russian Air Service), Canada, Estonia, Georgia (3 to 4 in 1920), Latvia, the Netherlands and Poland (1, see below). 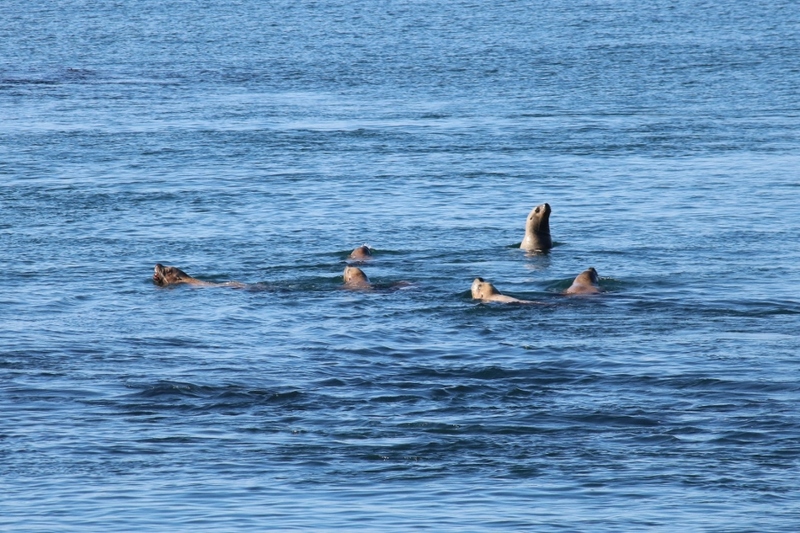 The United States Navy also continued to operate the type for training purposes. Wow! 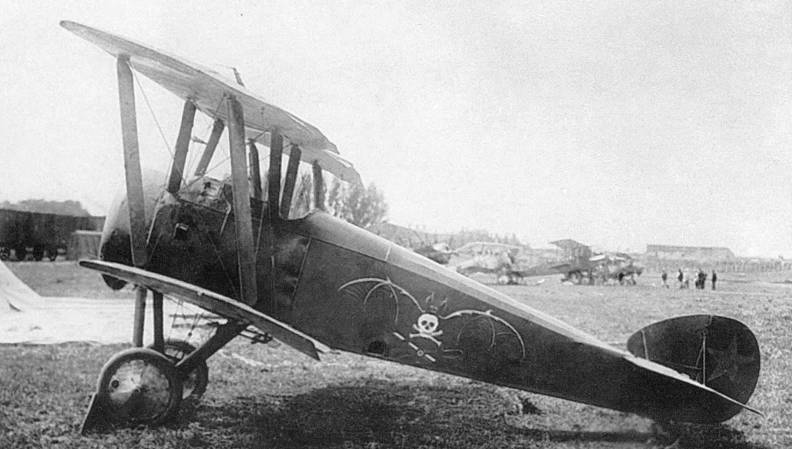 A Bolshevik Sopwith Camel F.1 captured from those supplied to Imperial Russia with an epic piece of art on the fuselage with a huge bat with skull and crossbones! 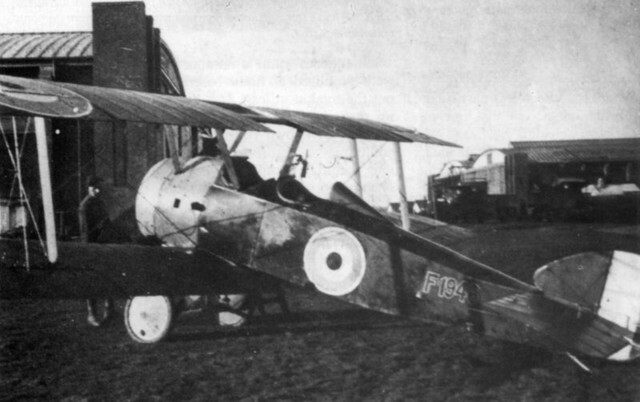 The Camel F.1 scout fighter was the main production variant from 1916 to 1918. 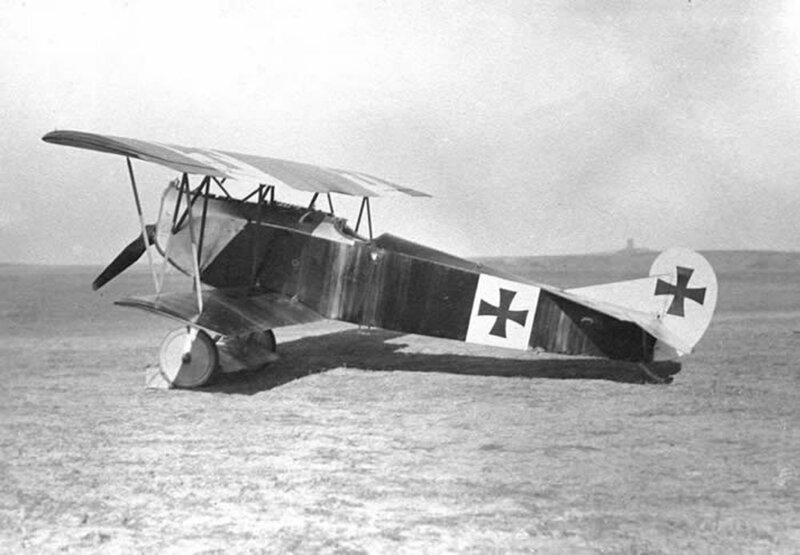 Modifications included the F.1/1 with tapered wings and a training variant with the machine guns removed and a second cockpit added behind the normal pilots position. 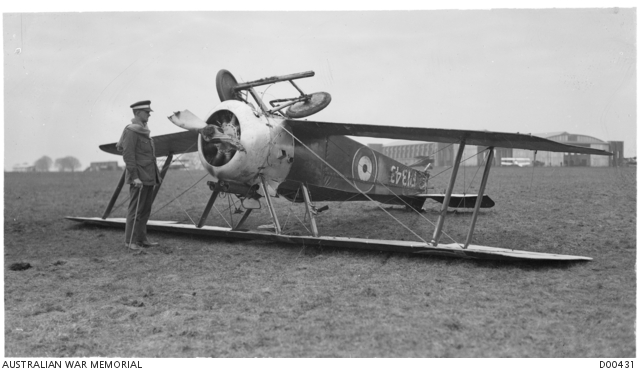 With the heavy losses of Sopwith Camel’s being used in the low-level ground attack role, the experimental Camel TF.1 was developed in 1918 with two Lewis guns fitted overwing in a downward firing angle for attacking trench lines (TF = Trench Fighter). Armour plating was fitted around the forward fuselage to protect against ground fire. 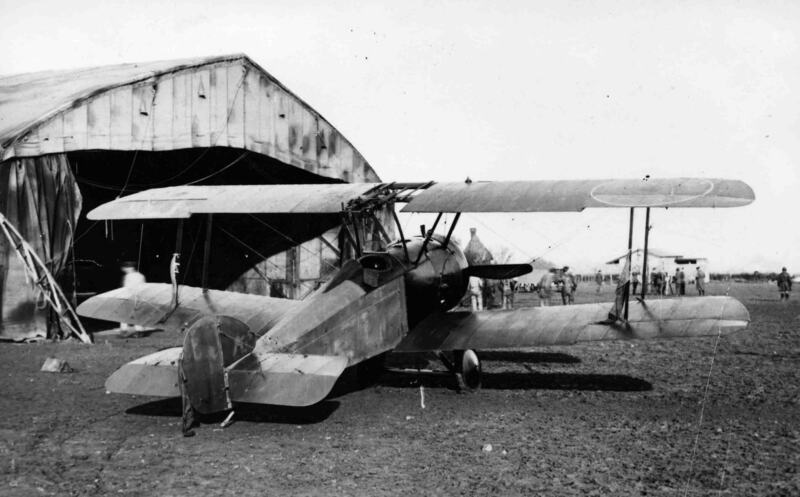 Although the TF.1 did not go into production, it led to the 1918 development of the Sopwith TF.2 Salamander ground attack aircraft which was itself, a variant of the new Sopwith Snipe. The Sopwith Camel F.1/3, unofficially known as the “Comic” was built in lesser number for use as a night fighter by RFC/RAF home defence and Western Front squadrons against German Zeppelin and heavy bomber raids. To reduce glare from muzzle flash, the nose cowling mounted Vickers machine guns were replaced by over wing twin Lewis guns on a Foster Mounting (designed to pull the gun down to reload but also allowed the guns to be shot upwards). To accommodate this change in gun position, the cockpit was moved slightly back by 30 cm (12 in) and to compensate the change in weight distribution, the fuel tank was moved forward. The Lewis guns were apparently also safer than the Vickers guns when firing incendiary rounds, which were more effective in night combat. 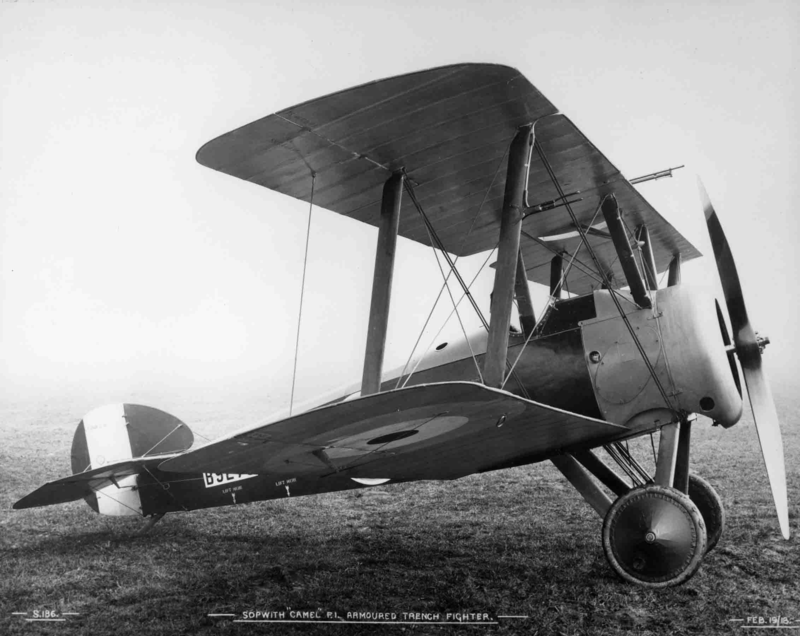 The Camel 2F.1 naval fighter first produced in 1918 differed in having a 150 hp Bentley BR1 rotary engine (more reliable than the Clerget 9B) which increased the maximum speed by around 13 km/h (8 mph), shorter wings, slim steel centre section struts replaced the wooden ones of the F.1 and an over wing Lewis gun replaced one of the nose cowling Vickers machine guns (although it appears some aircraft had twin over head Lewis guns and no Vickers). The fuselage could also be separated into two sections for shipboard storage. This variant served with the Royal Naval Air Service (RNAS) to defend against German Zeppelin bomber raids and seaplanes over the North Sea. 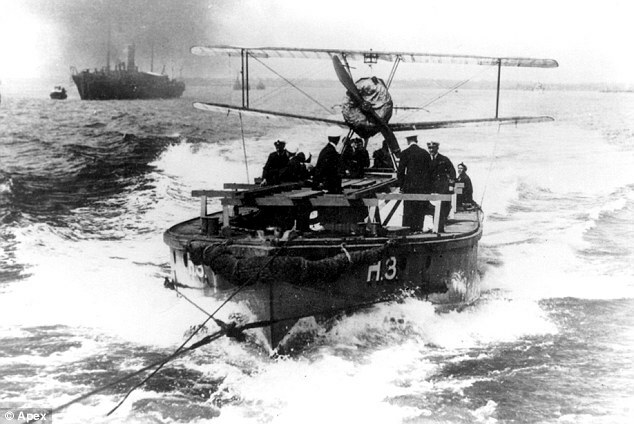 The Camel 2F.1 flew off a number of Royal Navy vessels including Thorneycroft Seaplane Lighters (see below), dreadnoughts and capital ships (launching from platforms on gun turrets), and HMS Furious (47), a Courageous Class battlecruiser converted to the first Royal Navy aircraft carrier. 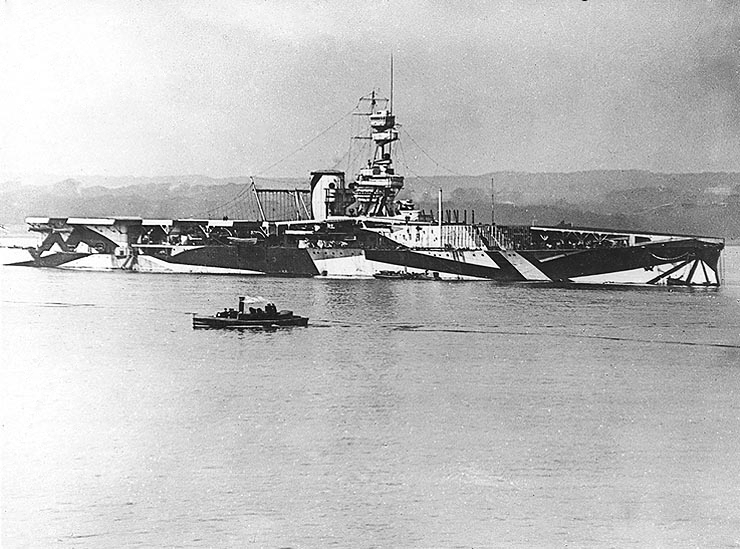 HMS Furious (47) was commissioned in 1917 and was initially built with a forward launching deck and hangar space for 10 aircraft, she later had a full flight deck added and eventually could carry 36 aircraft. In July 1918 HMS Furious (47) was involved in an attack on a German Zeppelin base in Denmark, launching seven Camel 2F.1 fighters on the Tondern Raid to attack airship hangars. This was the first attack of its kind launched from a carrier. It was a moderate success with the destruction of two Zeppelin’s (L.54 and L.60) and a balloon for the loss of one pilot. The Thorneycroft Seaplane Lighter was in a way, a 58ft predecessor to the modern aircraft carrier! Basically it was towed by another vessel, they would get up to a certain speed, then with the RNAS Sopwith Camel 2F.1 engine revved up, they would let it rip and hope it made it into the sky! The purpose was to extend the range of the aircraft and they could then be used to intercept enemy Zeppelin bombers. The pilot would then have to ditch the aircraft and await a rescue. Germany wasn’t the only nation with huge airships. Great Britain had them too and in 1918 they experimented with the concept of carrying a parasite fighter aboard, to be launched to protect the airship from enemy aircraft then land down below. Sopwith Camel 2F.1 (N6814) was used in successful tests to launch from Royal Navy Airship HMA 23 (constructed by the Vickers Company). 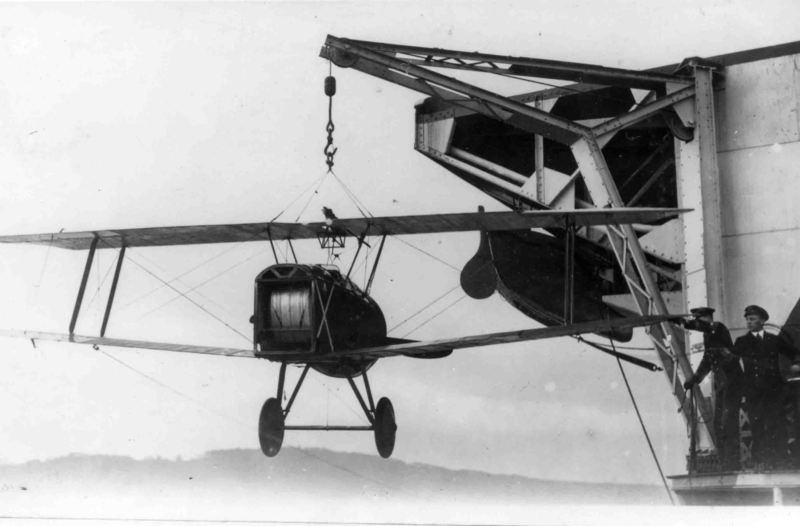 The Camel was launched from beneath the airship using specially made slings. In early unmanned tests, a dummy sat in the cockpit, the flight controls were locked and the Camel was launched and safely glided down to earth. In the manned tests, pilot Lieutenant E. Keys was dropped, started the engine successfully, pulled out of the dive, circled the airship and then landed safely. 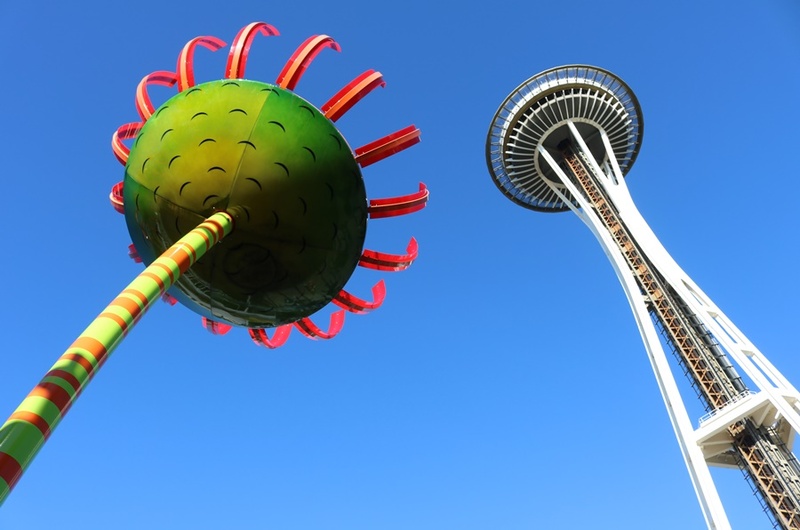 Although a success, no further parasite fighter tests were conducted until after the war with another airship and it was not until the 1930’s that the process was really perfected by the United States. 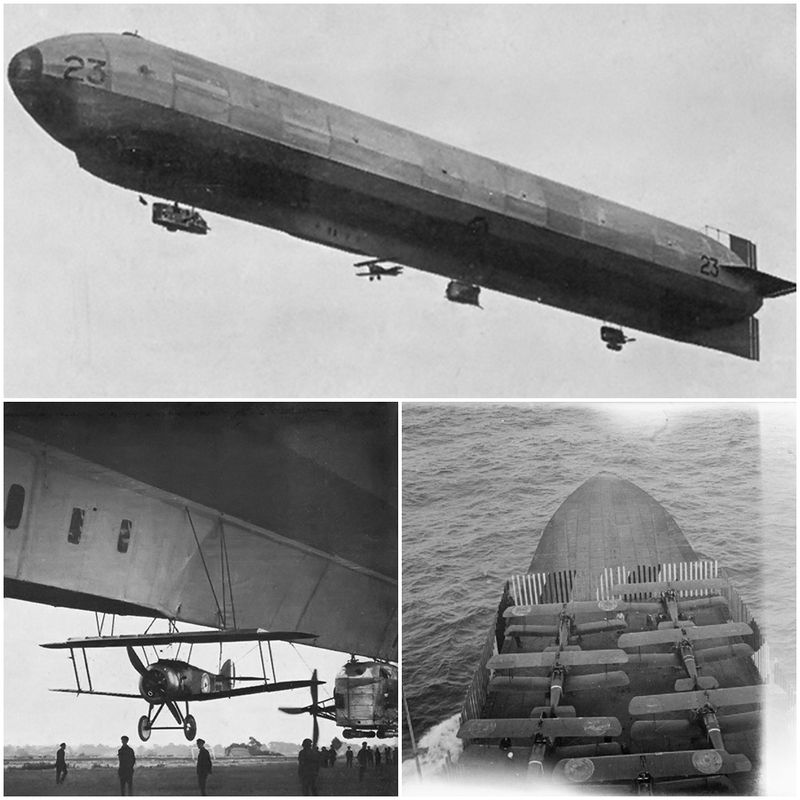 From Royal Navy Airships (HMA 23) to early aircraft carriers (HMS Furious) the Sopwith Camel 2F.1 proved adaptable! 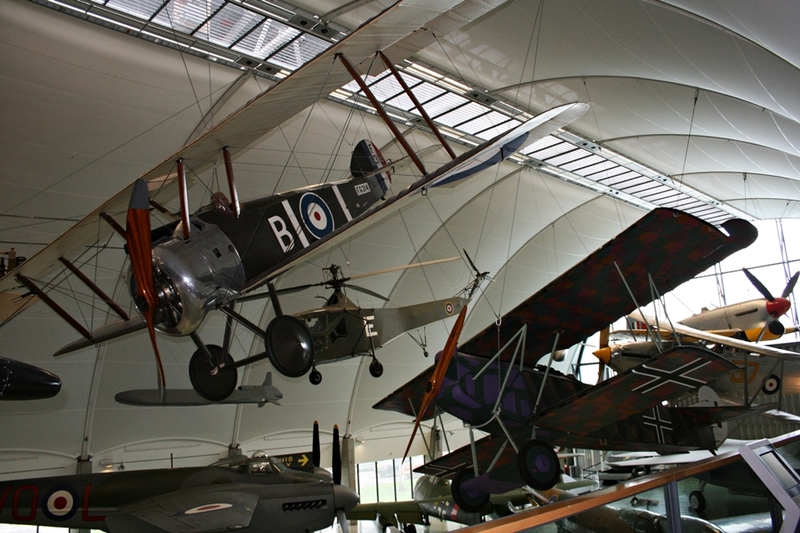 Of 5,490 Sopwith Camel aircraft produced, just 8 original examples survive in today. I realised recently, that over the past few years I had unintentionally managed to see nearly all of these original aircraft and they are in diverse locations across the world! 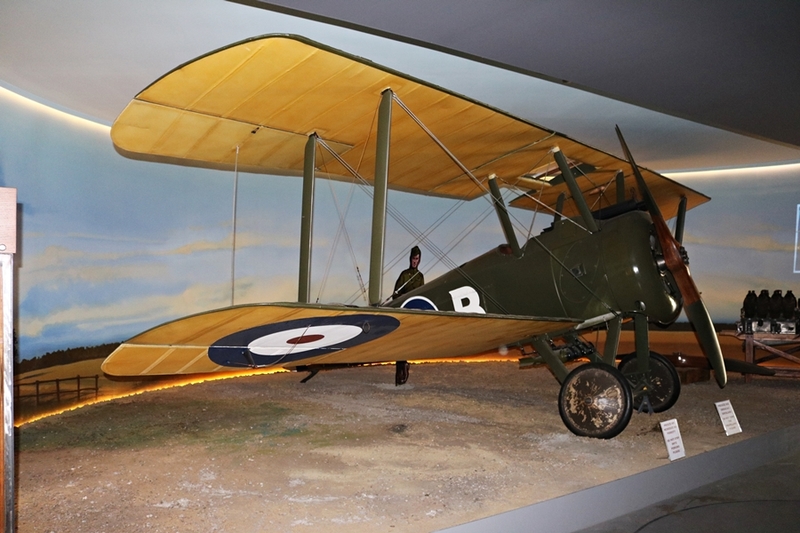 The Sopwith Camel F.1 (F6314) at the Royal Air Force Museum in Hendon was built in October 1918 by Boulton and Paul Ltd. of Norwich (they produced 1,575 Sopwith Camel scouts). 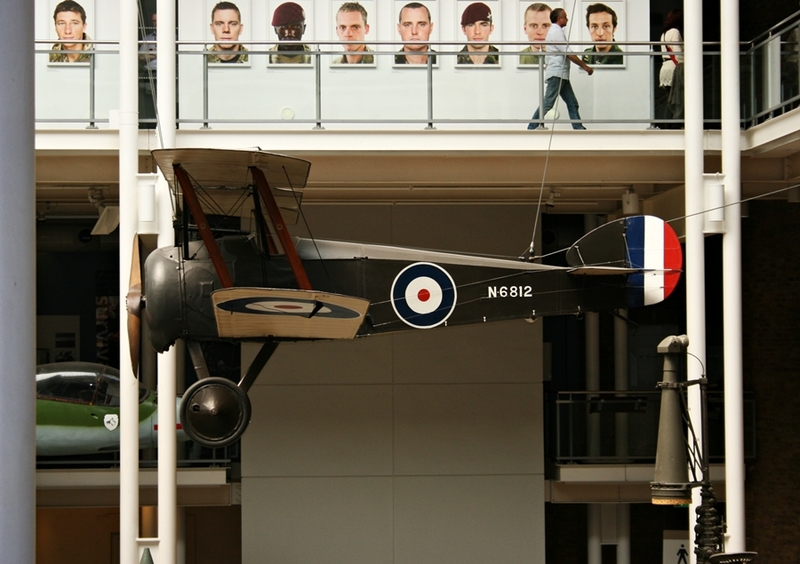 During my visit in 2012, the aircraft was displayed suspended from the ceiling in the Milestones of Flight hall, painted to represent a No. 65 Squadron aircraft marked code B (it was in a spot that was quite tricky to photograph from different angles). Sopwith Camel F.1 (F6314) in the Milestones of Flight hall at the Royal Air Force Museum in Hendon (2012). It is painted to represent a No. 65 Squadron aircraft marked code B. The Camel was put into RAF storage in 1919 and sold as surplus in 1923 (without engine and instruments) to a former Camel pilot, journalist Grenville O. Manton. During its return to flight as a civil aircraft, Manton installed a small 45 hp Anzani rotary engine which required a conversion of the nose and leaving the engine uncowled to make it suitably fit. Apparently the aircraft fabric was doped white against Manton’s wishes (it seems over the years it was painted numerous times and it was difficult to identify which aircraft it was for many years!). The Anzani engine, not too surprisingly proved too underpowered and the rudder proved inadequate – Manton and a friend only flew it twice before deciding it was too dangerous to fly. Soon after he sold it and during the 1930’s the Camel changed hands a number of times. By 1936 it was owned by racing car driver R G J Nash who installed an original Clerget 9B rotary engine but dry rot had set into the airframe and it could not be flown. For many years the Camel F.1 was kept in storage and occasionally displayed at air shows and a museum. In 1953 Mr. Nash sold it to the Royal Aeronautical Society under the provision it would not be flown after restoration. It was not until between 1958 and 1962 that restoration work was completed to bring the aircraft back to being flight capable. It was displayed at various events until put on permanent display at the RAF Hendon museum in 1971. In 1992 the UK Ministry of Defence purchased the Camel from the Royal Aeronautical Society for permanent display at the museum. 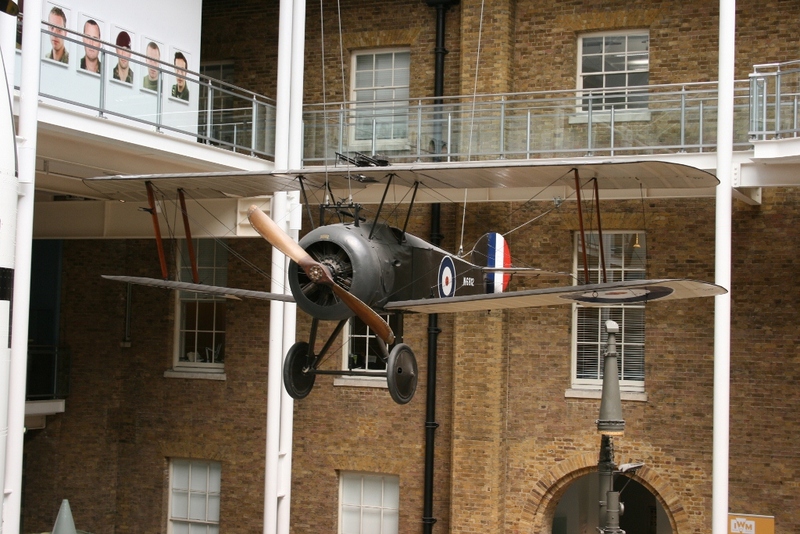 The Sopwith Camel 2F.1 (N6812) naval fighter at the Imperial War Museum in London was built by William Beardmore & Company in 1918. 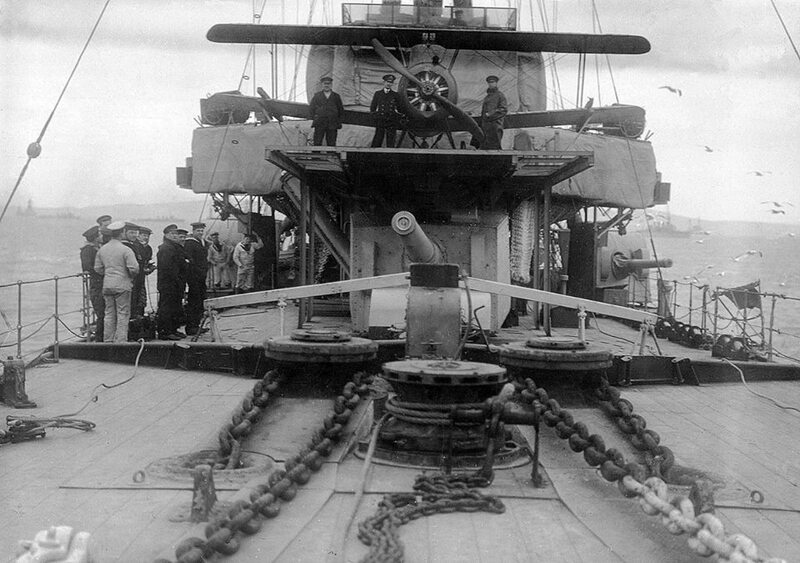 The armament of the naval variant features the mounting of twin Lewis guns over the top wing. The viewing area around the grand atrium of the museum gives a great view from different perspectives and levels. This aircraft was flown by RAF pilot Lieutenant Stuart D. Culley when he shot down the Imperial German Navy Zeppelin L 53 (V Class, Production Number LZ 100) over the southern area of the North Sea on August 11th, 1918 after being launched from Thorneycroft Seaplane Lighter H.5 towed by destroyer HMS Redoubt. It apparently took him and hour to get up to the altitude of the Zeppelin! 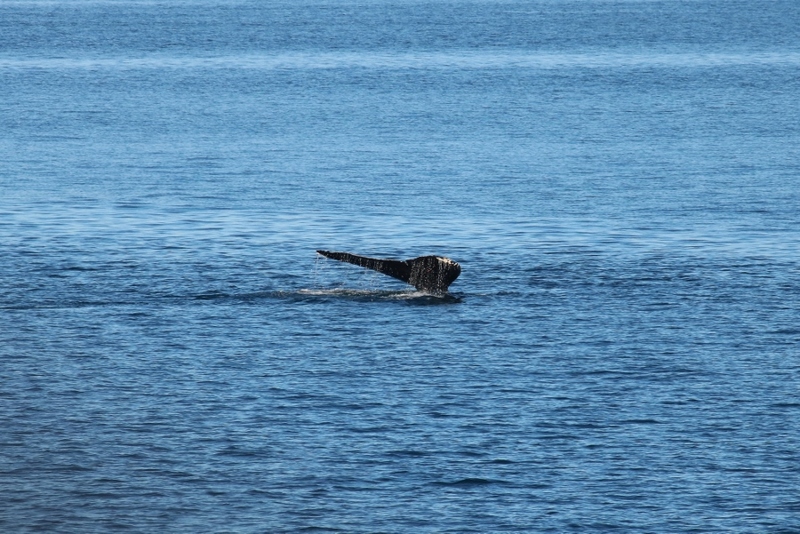 He landed safely back on the water close to the lighter and the Camel was recovered almost undamaged. 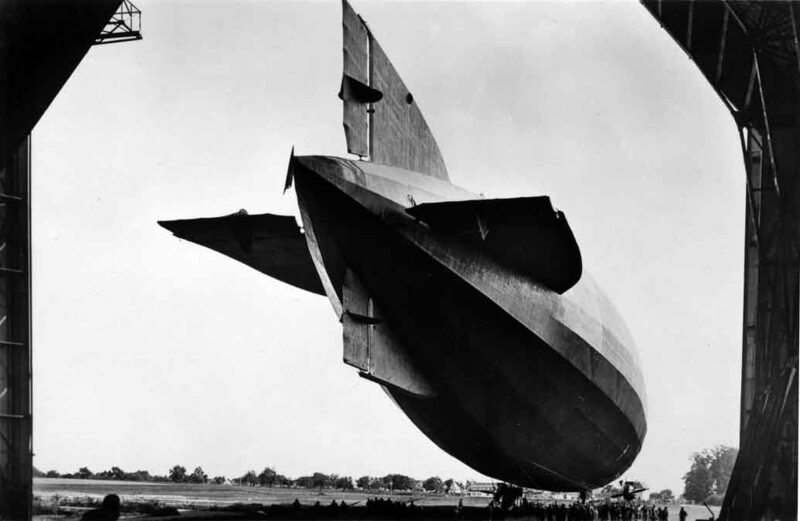 Zeppelin L 53 was built on August 8th, 1917 and had been somewhat of a nemesis to England having conducted 19 reconnaissance missions and 4 bombing missions over the nation, dropping 11,930 kg of bombs in the process. It was a prized victory and the last German Zeppelin shot down in the war. 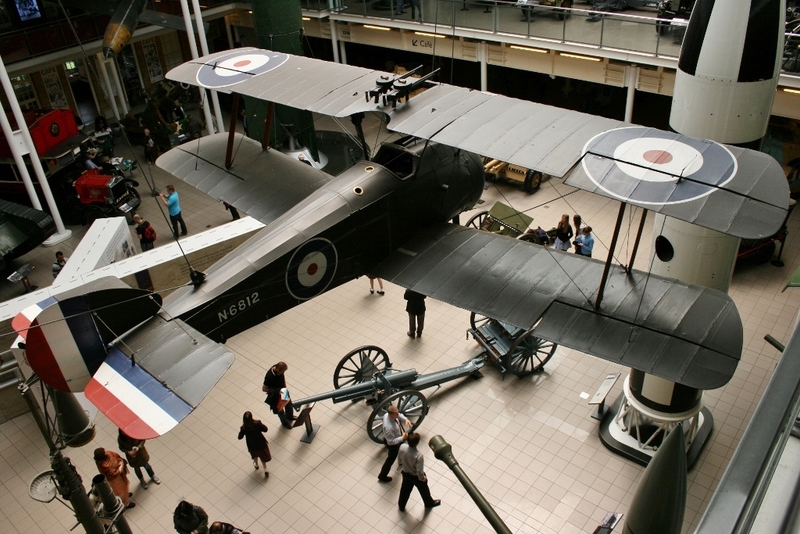 The Royal Museum of the Armed Forces in Brussels, Belgium houses their sole surviving Belgian Military Aviation Sopwith Camel F.1 (B5747). Interestingly this aircraft built by the Clayton and Shuttleworth company is displayed with just one Vickers machine gun. 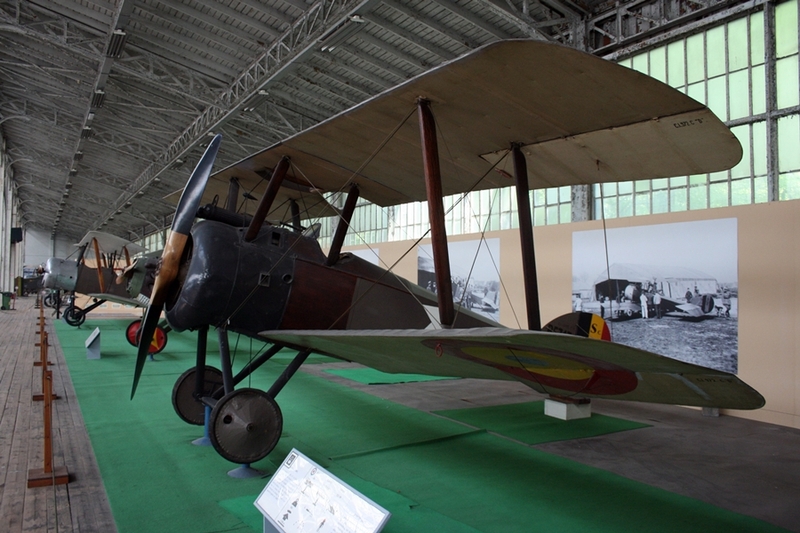 The type flew in Belgium with the 1ère, 9ème and 11ème Escadrille de Chasse during World War One. 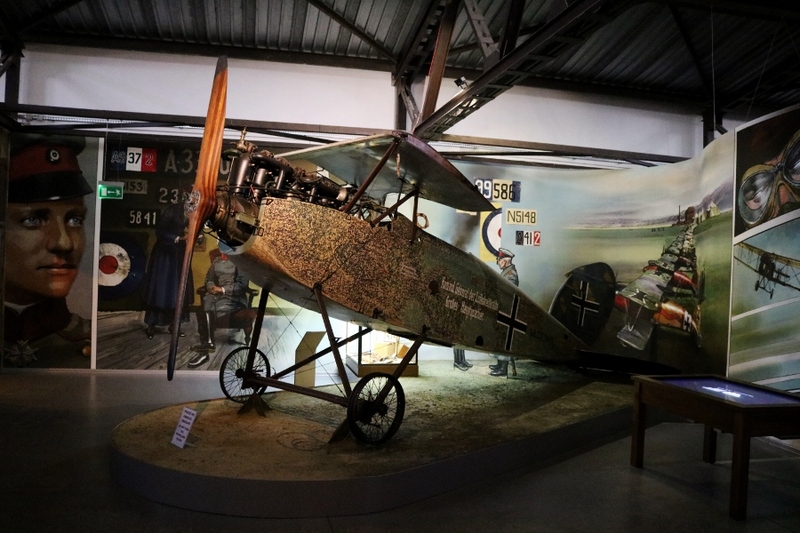 This is a fantastic museum with a large collection of aircraft from World War One and beyond, along with tanks, weaponry, uniforms etc from throughout Belgian history. I was lucky to be able to visit there in the summer of 2012. 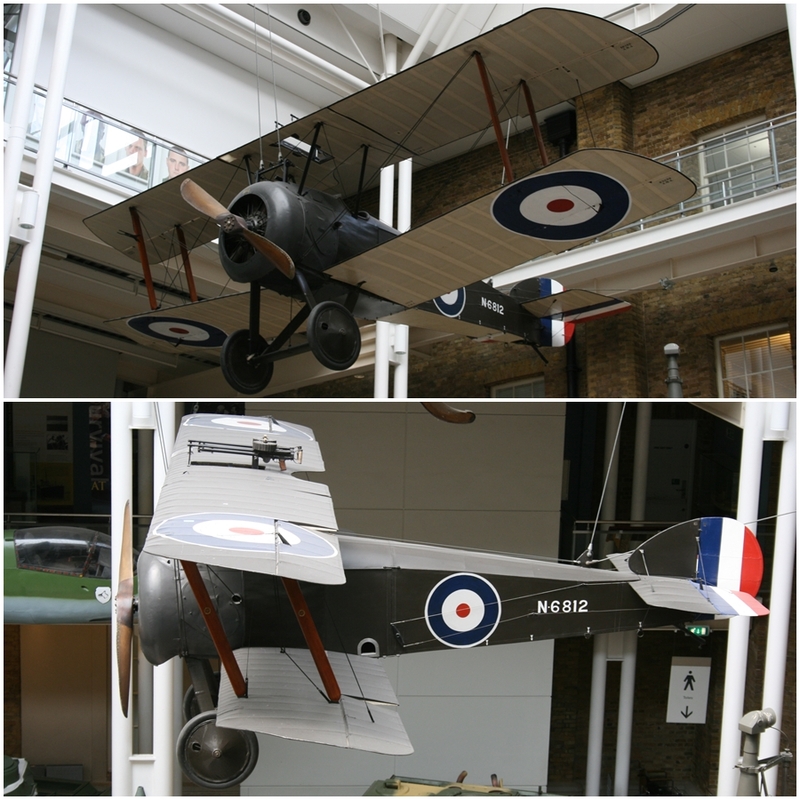 Belgian Knights of the Sky – The famous Sopwith Camel F.1 was one of the best scout fighters of World War One – Royal Museum of the Armed Forces in Brussels, Belgium during my visit in the summer of 2012. The type flew in Belgium with the 1ère, 9ème and 11ème Escadrille de Chasse. Note it is fitted with just one Vickers machine gun. 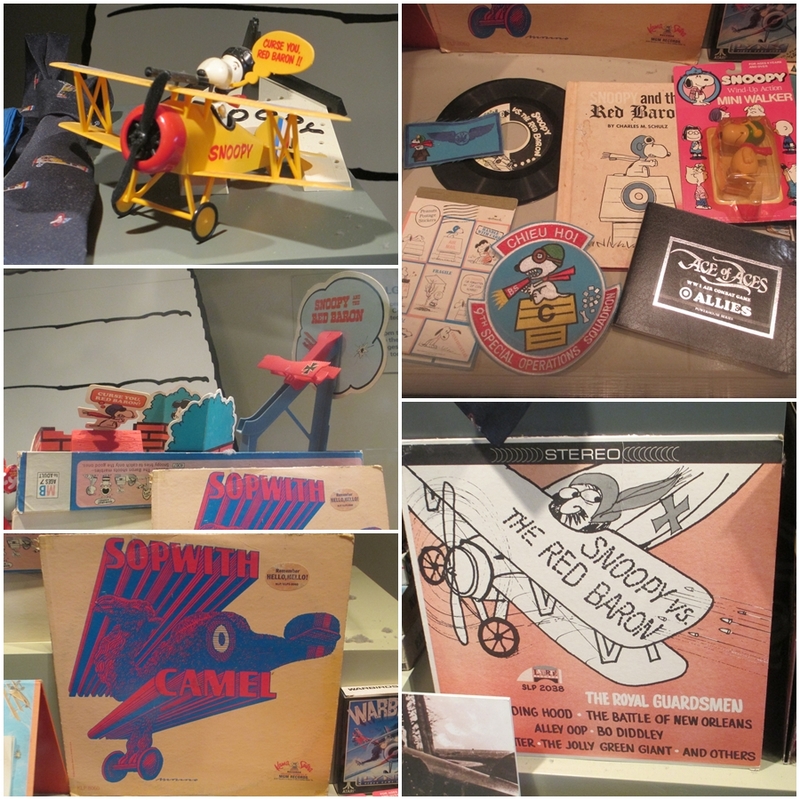 I made my way up to the Canadian capital of Ottawa, Ontario in 2013 to visit the Canada Aviation and Space Museum and quickly discovered that with aircraft spanning all ages of aviation in Canada and beyond, this was a museum collection not to be missed! 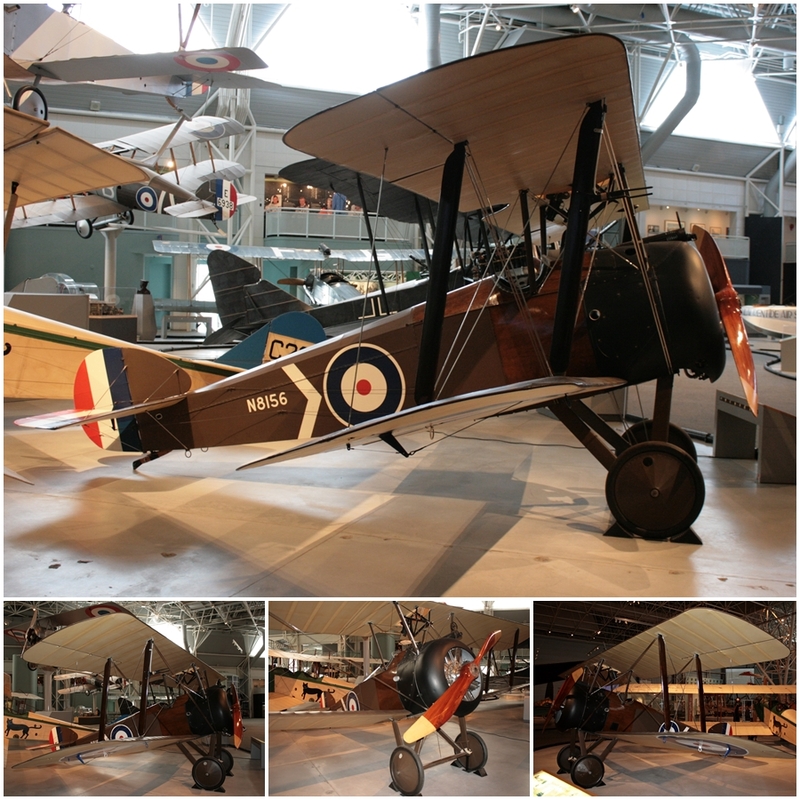 Within their collection they have a beautifully preserved Sopwith Camel 2F.1 (N8156) naval fighter, which was built in 1918 by Hooper & Company Ltd. and entered Royal Canadian Air Force Service in 1925 as a ground instructional airframe. The Camel 2F.1 was donated to the National Research Council Aeronautical Collection in Canada for display between 1936 and 1940. It was then put into storage until restored to flying condition by C. R. Swanson in Illinois, USA in 1966-1967 and was last flown in 1967. It was then on loan to the Canadian War Museum also in Ottawa until 1995. Unfortunately I have not yet seen the flyable and original Sopwith Camel F.1 (N6524) owned by the Peter Jackson’s The Vintage Aviator at Hood Aerodrome, Masterton (you can see some great photos of the aircraft by James Fahey here). Not a lot is known about the aircraft and there is some confusion about its true serial number. Built in 1917, it was imported into the United States in 1920 by Clarence D. Chamberlin, who used it as a bit of a flying hack, it then was sold to Colonel George Burling Jarret in 1931 for just $100 to be displayed at his World War One museum in New Jersey and this is where the identity crisis began due to someone stealing the makers plate from the museum! The aircraft spent World War Two in storage and in 1948 was on loan to the United States Air Force before being sold in 1950 to Frank Tallman of Boston, who restored the aircraft to flight in 1955 as N6254 and used it in movies. After this period the Camel changed hands a number of times, being owned by the Aeroflex Corporation who displayed it in New York and it was also on display as the US Marine Corps Museum in Virginia. The Smithsonian National Air & Space Museum purchased the Camel for $40,000 USD (!) in 1968 and in the early 1980’s it was purchased by the Arkansas Aviation Historical Society, who prior to it going to New Zealand in around 2012, displayed it at the Aerospace Education Centre in Little Rock, Arkansas (they closed down due to financial issues). Restored by The Vintage Aviator and put on public display in 2016, this original Sopwith Camel is fitted with a Clerget 9B rotary engine and wears the marking of B5663 flown by A Flight of RNAS No. 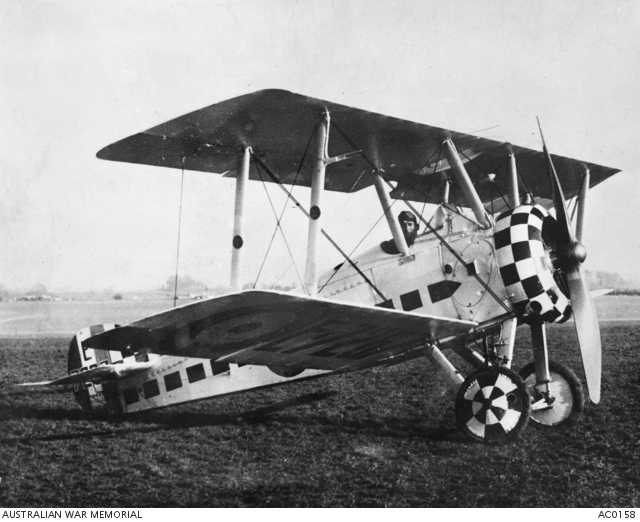 10 Squadron, an aircraft flown by Flight Lieutenant Curtis when he scored his 11th aerial victory in 1917 (he finished the war with 13 victories). The depicted aircraft was lost in a collision with a German Albatros in January 1918. 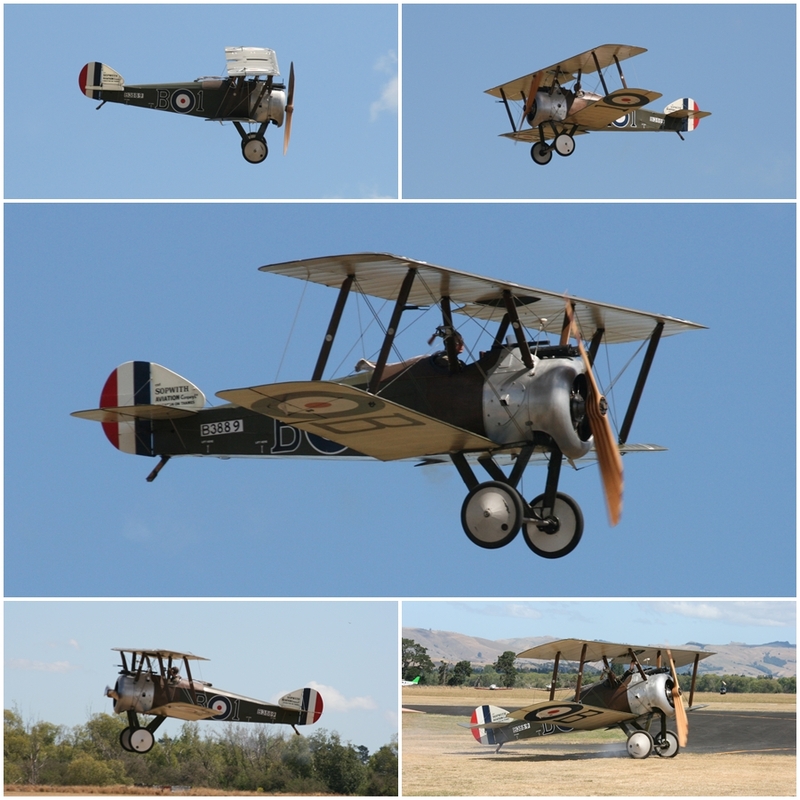 There are a number of replica and reproduction Sopwith Camel aircraft flying and static around the world. 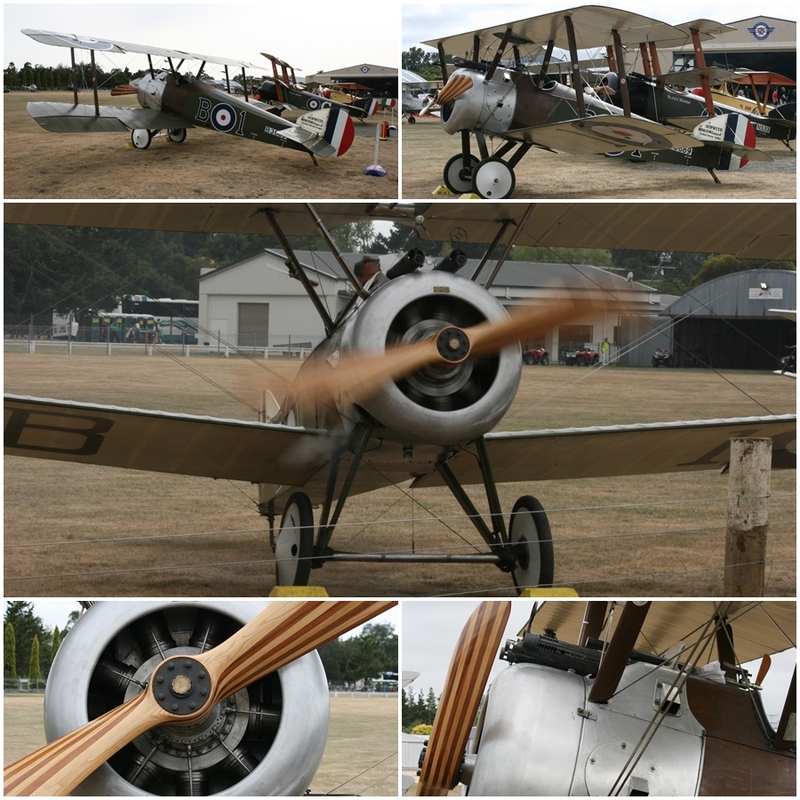 At Wings Over Wairarapa 2013, at Hood Aerodrome I saw the convincing replica Sopwith Camel owned by The Vintage Aviator Ltd. that features a number of original components including a 160 hp Gnome rotary engine, instruments and even a wicker seat! The aircraft wears the serial number and markings of RFC No. 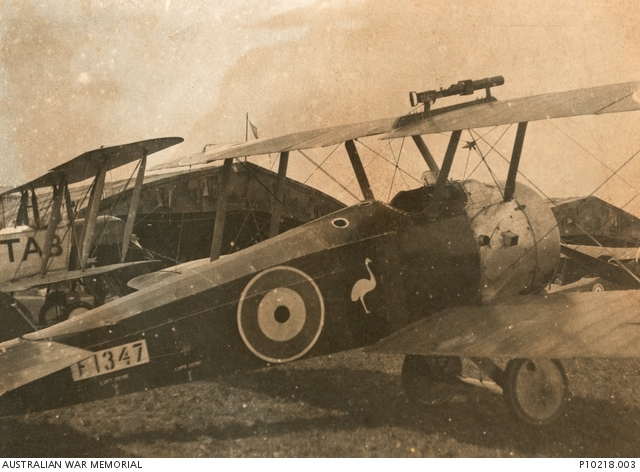 70 Squadron Camel F.1 B3889, coded B1, which was flown by a New Zealander, Captain Clive Collett during the war. He became the first pilot to score a victory flying Sopwith Camel fighters on July 27th, 1917 and shot down 5 of his eventual 12 aerial victories whilst flying the original aircraft he replica represents between August 13th and 25th, 1918 (all his victories were achieved flying four different Camel aircraft). Sadly Captain Collett died in an accident test flying a captured German Albatros in Scotland before the war ended in 1918. The replica Camel was completed in the United States by Gerald Thornhill and Carl Swanson in 1985. Peter Jackson imported it into New Zealand in 1997 and it made its air show debut in New Zealand in 2001. It is registered as a Gerald Thornhill TS-1 (Sopwith Camel Replica). This started a major industry in New Zealand, with the founding of The Vintage Aviator Ltd. in 2004 which has become world renown for producing replica and reproduction World War One aircraft. 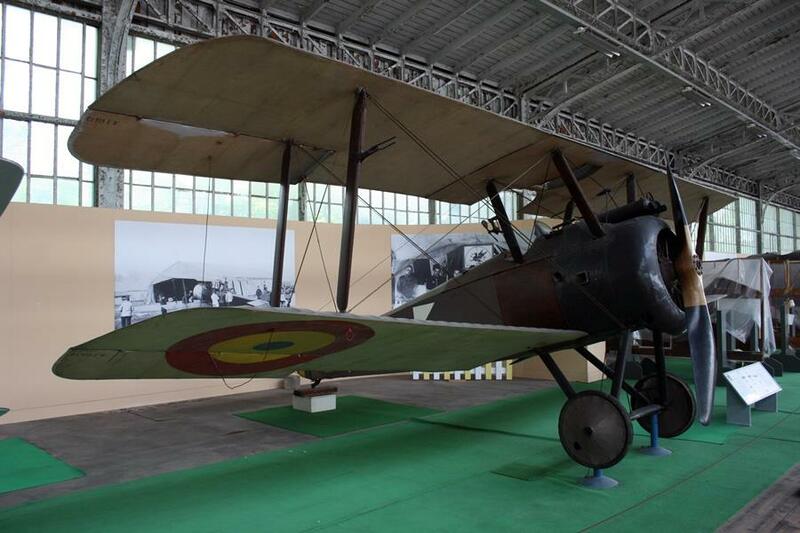 Within the Polish Aviation Museum in Krakow (Muzeum Lotnictwa Polskiego w Krakowie), sits Sopwith Camel F.1 (B7280). This aircraft has a very interesting history. Built in Great Britain in 1917 by the Clayton and Shuttleworth company, this Sopwith Camel participated in combat flying with Royal Naval Air Service (RNAS) and then newly formed Royal Air Force squadrons. Whilst flying with RAF No. 210 Squadron, British pilots tallied 11 German aircraft in B7280 – Flying Officer J.H. Foreman achieved 2 victories and Flight Lieutenant H.A. Patey had 9 victories. On September 5th, 1918, B7280 piloted by Patey was forced down behind German lines and fell into enemy hands. 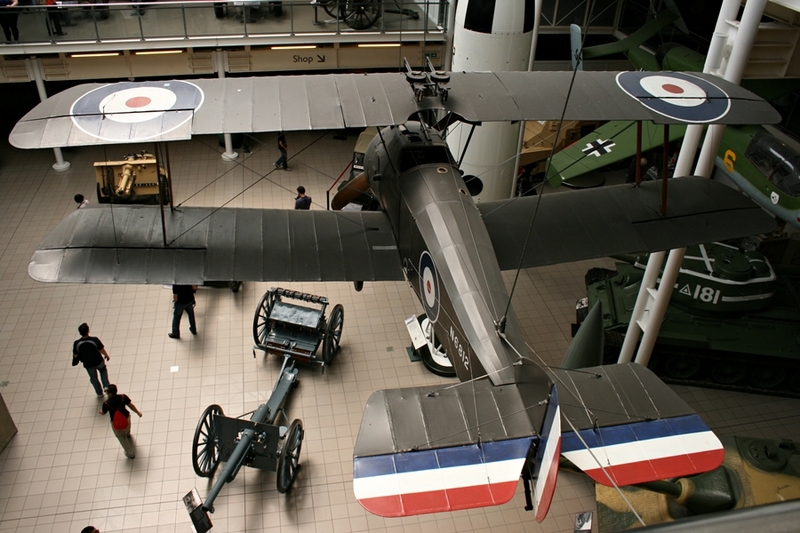 Following its capture the Germans conducted flight testing of this Sopwith Camel, then it became part of the German Aviation Collection in Berlin at the Deutsche Luftfahrt Sammlung (German Aviation Museum). 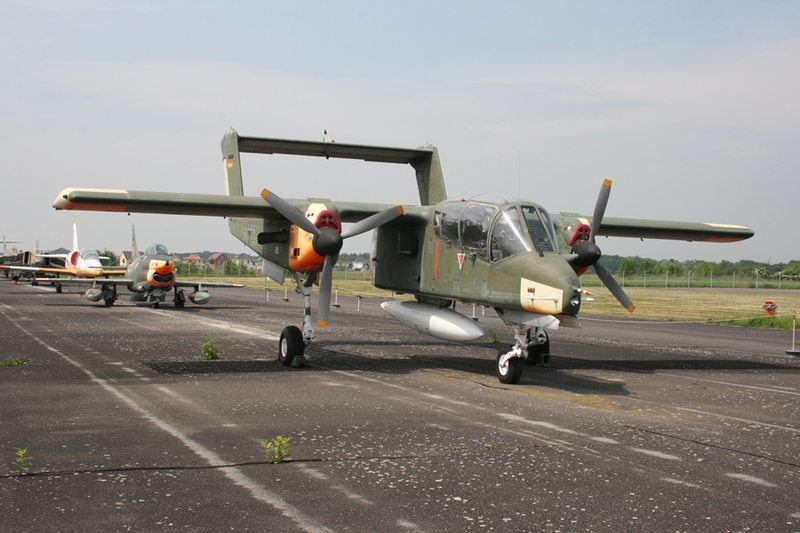 The aircraft collection was transferred to Czarnków, near Poznań in the occupied territory of Poland around 1942 to 1943 to avoid Allied bombing (the Berlin museum was later destroyed in bombing raids!). Fortunately it survived the war and went into storage until transferred to the Polish Aviation Museum in 1963, where it has remained to this day (I paid a visit to this excellent museum in September 2017). The wings and fabric had to be completely restored (perhaps replaced?). 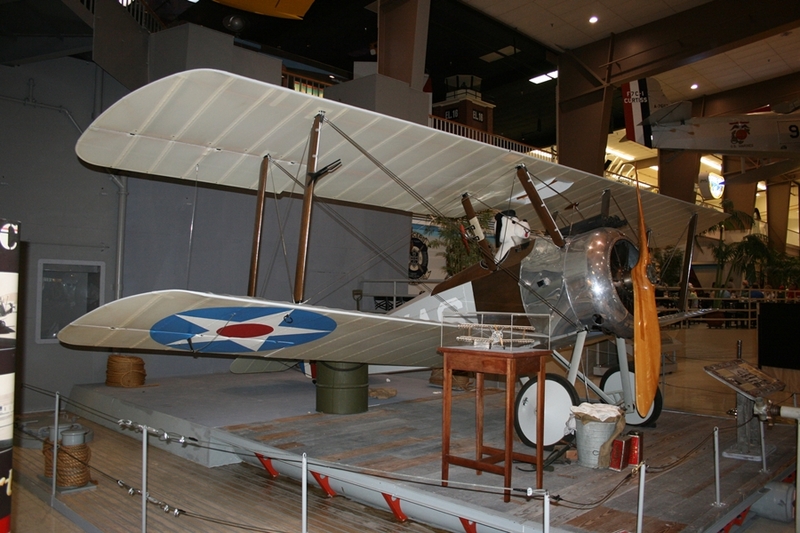 Sopwith Camel F.1 (C8228) is a static display the National Naval Aviation Museum in Pensacola Florida. Post War the United States Navy also experimented with launching Camel fighters off capital ship gun turrets. They received six for this purpose and conducted tests at Guantanamo Bay, Cuba. The pilots would normally land ashore but the aircraft were fitted with underwing inflatable air bags if they did need to set down on water. US Navy Sopwith Camel F.1 (C8228) with Snoopy! 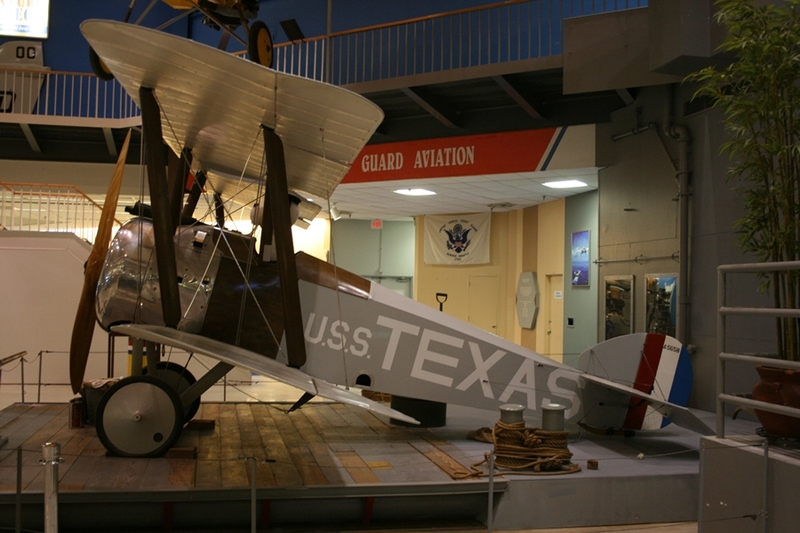 National Naval Aviation Museum in Pensacola Florida (2011). This Sopwith Camel wears the markings of an aircraft operated off the battleship USS Texas (BB-35), which was commissioned in 1914 and on March 10th, 1919 became the first US Battleship to launch an aircraft, when Lieutenant Commander Edward O. McDonnell flew a Sopwith Camel off the ship. 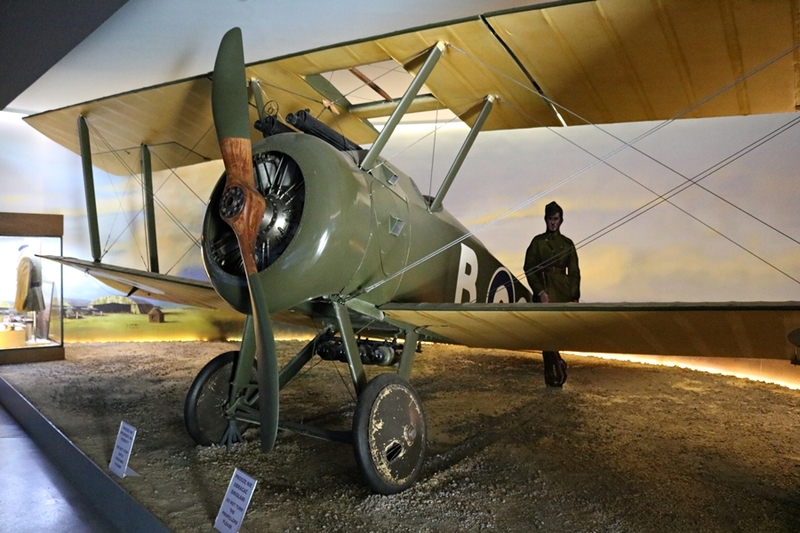 Sopwith Camel F.1 (B6291) is on display at Smithsonian National Air & Space Museum Udvar-Hazy Centre in Chantilly, Virginia. 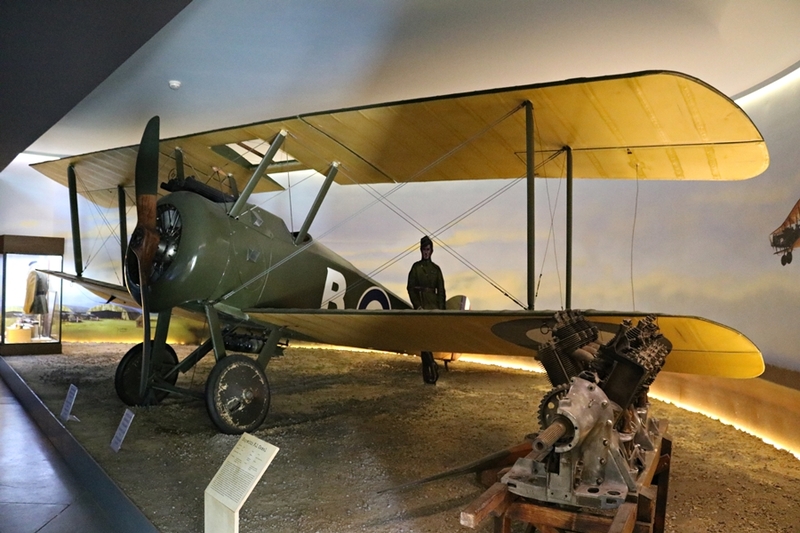 It is the only surviving example that was actually built at the Sopwith factory (the rest of the survivors were built by subcontractor companies). 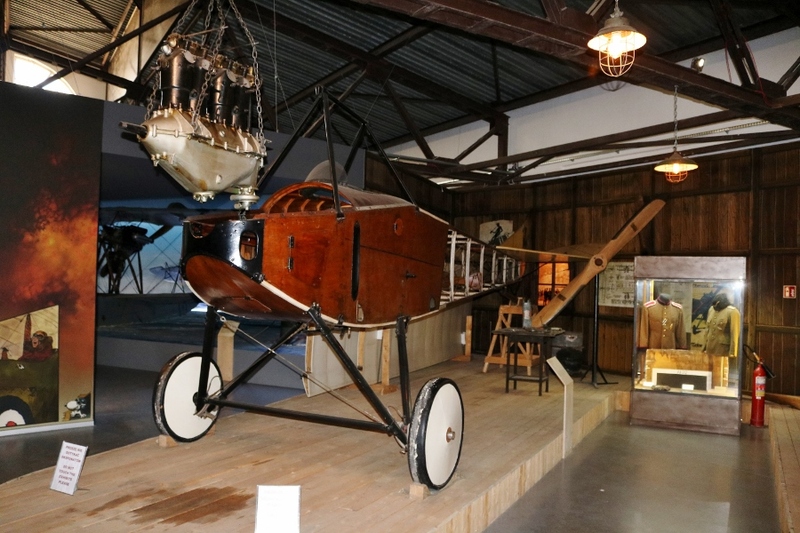 This aircraft was previously part of Javier Arango’s, The Aeroplane Collection in Paso Robles, California but following his passing, it was donated to the Smithsonian collection and went on public display in 2017. It is reportedly a magnificent restoration and flight capable. 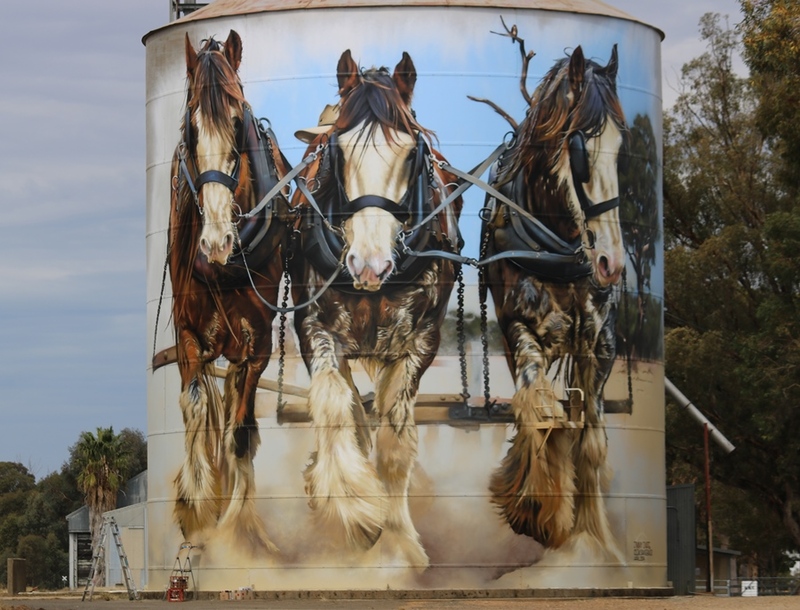 Unfortunately I haven’t been there since 2013, so I have not seen this fantastic piece of history! 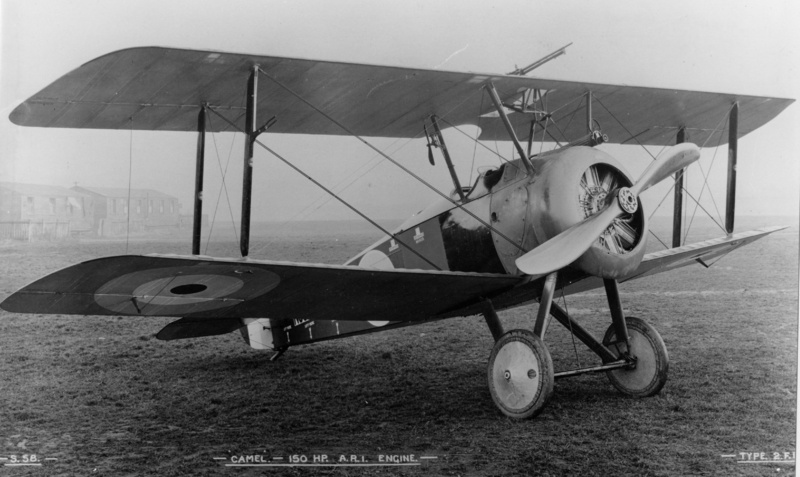 This Camel F.1 originally flew with the Royal Naval Air Service in France during September 1917 with No. 10 Squadron but it was damaged that same month in a forced landing and was returned to England. By 1918 it was rebuilt and being used for training in England but experienced a take-off crash in June 1918 and was wrecked again. It seems to have been used as a training aid until the end of the war and was sold off as surplus to a pair of former RFC pilots but it was never returned to flight and stayed in storage until the 1960’s. Purchased by aircraft restorer Lt. Commander Desmond St. Cyren it again remained in storage until restoration work began in the 1980’s. 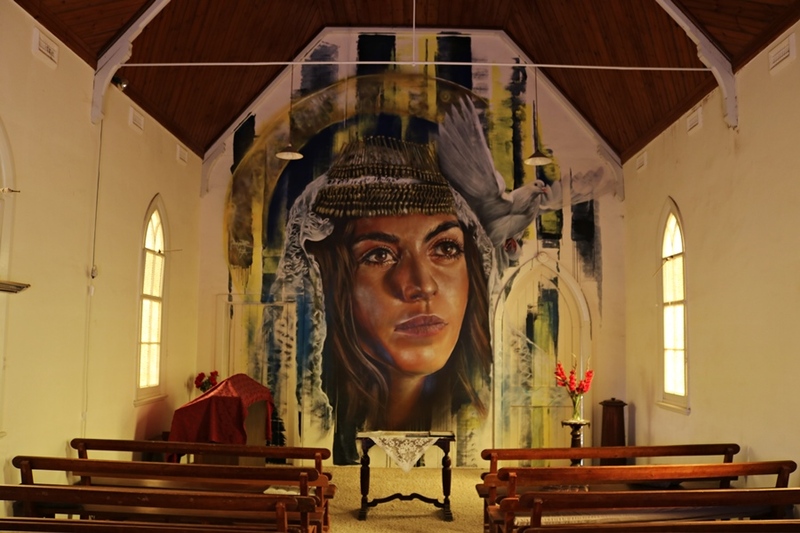 Purchased by Tony Ditheridge 1990, it was returned to flight in 1992 and in 1994 was sold to a buyer in the United States before being acquired by Javier Arango in the mid 2000’s. It was not authorised for flight by the FAA in the United States until 2006 (information sourced from Warbird Digest). 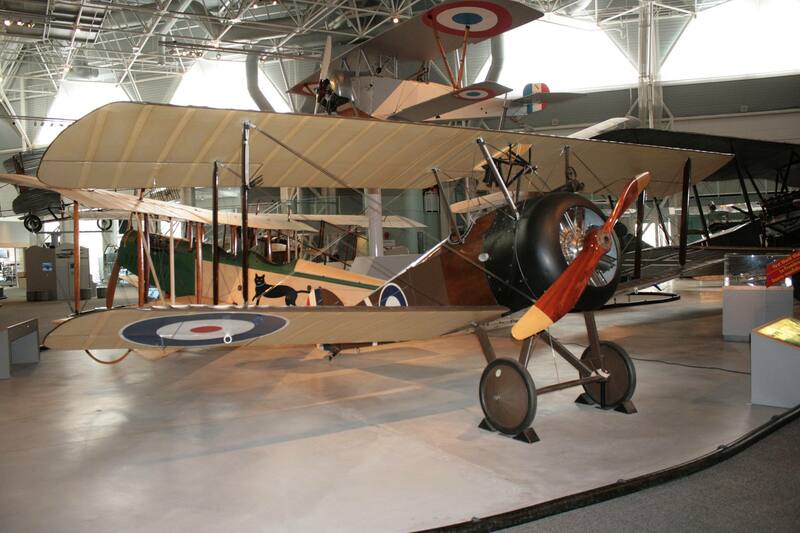 Although long gone from air force and navy ranks, the Sopwith Camel remains an iconic aircraft. Peanuts and Snoopy the dogs eternal battle with the Red Baron has certainly helped keep it within popular culture ever since (albeit he imagines his doghouse is a Sopwith Camel)! In my next post I will take a look at the surviving Sopwith Snipe scout fighters. The less well-known replacement for the Sopwith Camel.